The Struggle for Uzbekistan – a Key Component of Washington’s Central Asia Pivot? Out of all of the former USSR-dominated regions, Central Asia remains the only one where the US hasn’t acquired sustainably aligned satellite countries. For this very reason, we can expect the US to start making steps towards economic integration with a number of leading regional players in the immediate future. 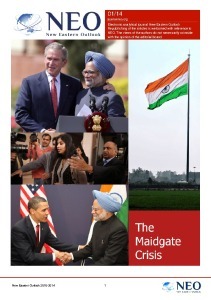 To facilitate the study of association options it has with Central Asian states, Washington would establish a number of research institutes that are being supported by a myriad of NGOs that the US has typically used anywhere it seeks to establish a political foothold to start shaping regional processes according to its own interests. However, many analysts remain ignorant of this fact, as they don’t understand that an association of Central Asian states may become a strong economic and political competitor to both the US and EU. The notorious American geopolitical intelligence platform – STRATFOR has recently published its geopolitical forecast for 2019, which puts an emphasis on Washington’s attempts to strengthen its ties with the countries located along the former Soviet periphery. This means that Russia will face what is essentially described in the American military language as multi-level warfare aimed at undermining the political, economic, energy and military security of the state. Regarding Washington’s strategic goals in Central Asia, STRATFOR reveals that the US is interested in influencing Uzbekistan, the state most Western think tanks would typically elevate as the “strongest player out of the Central Asian big five.” What this basically means is that Washington is going to make an attempt to dominate this country politically through a number of tricks it has in its book. Among them is the possible deployment of additional troops to Central Asia under the pretext of fighting terrorism and drug trafficking, along with the reestablishment of economic ties with Tashkent in a bid to outrun the rapidly growing Russian and Chinese investments in the Uzbek economy. Predictably enough, STRATFOR describes a qualitative change in the number of American troops deployed to the region by far the most important component for the upcoming struggle for Central Asia. It should be recalled that the military cooperation between Uzbekistan and the United States reached its peak in the early 2000s, in the aftermath of the 9/11 attacks. Back then the Pentagon was even allowed to build a military base in this Central Asian republic, that would be used to supply Washington’s operations in Afghanistan, which resulted in Uzbekistan becoming a principal ally of the US in the region. However, this cooperation faced an abrupt end due to the massive Andijon unrest of 2005, which resulted in Uzbek authorities voicing criticism of the US. This resulted in demands to withdraw American troops from Uzbekistan as relations between the two states kept deteriorating. However, in recent years, one could notice a gradual positive tilt in the bilateral ties between Washington and Tashkent, as military departments of the two states launched a series of joint military activities. So, ever since the sitting Uzbek president Shavkat Mirziyoyev took power from his deceased predecessor in 2016, out of the blue rapprochement with Washington appeared on the list of Tashkent’s foreign policy priorities, putting a particular emphasis on the military component of this rapprochement. Last year, Mirziyoyev made his first official visit to the United States, during which he visited the Pentagon to hold a meeting with the former US secretary of defense, James Mattis. 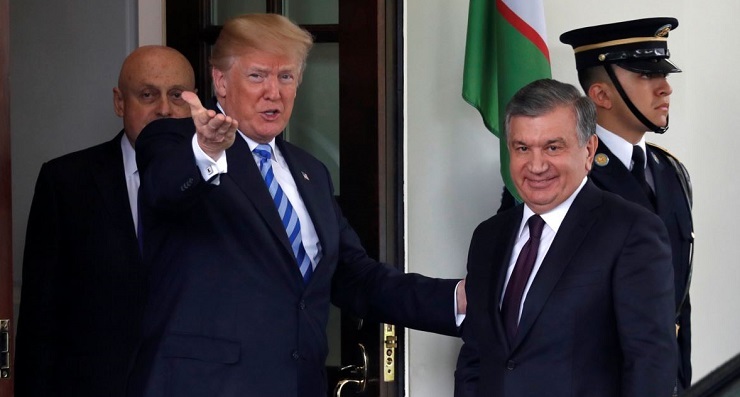 In the aftermath of the meeting the president of Uzbekistan announced that his country was interested in deepening military ties with the United States, Moreover, upon his return home we would describe the US as the important geo-strategic player in the region. The above mentioned visit marked the first major bilateral contract signed between Tashkent and Washington, the total worth of which exceeded 4.8 billion dollars. This deal included agreements on the supply of Uzbek uranium to the United States, as Uzbekistan is among the world leaders in discovered uranium reserves. In return, Washington promised to supply its aircraft to this Central Asian state, along with promoting cooperation in hydrocarbon, electric and engineering spheres of the economy. At the same time, the package of economic proposals that Russia offered to Uzbekistan last year looks more substantial. This economic package with a total worth of 27 billion dollars was put on the table by Russia’s president Vladimir Putin who visited Tashkent last October. However, in a bid to draw Uzbekistan into its sphere of influence, the United States would hold a number of business forums in the country on the very same month, in particular, the VIII Central Asian Trade Forum (CATF), which was held under the patronage of USAID. Following the recipes of Zbigniew Brzezinski, the United States is trying to turn Uzbekistan into a pillar of its influence in Central Asia. According to these designs, Washington would enjoy a solid foothold in the region should it be able to entrench itself militarily in Uzbekistan. The testament to the importance of this region to Washington is the unprecedented number of American official delegations visiting the Uzbek capital day in and day out. However, it would be a naive mistake to assume that all those friendly steps that Washington has made were aimed at pursuing the best interest of the Uzbek people. They are signs that the US has made in countless attempts to draw Tashkent away from its traditional strategic ally, Moscow, in a bid to drive a wedge in Russian-Uzbek relations, while jeopardizing Central Asian integration initiatives. 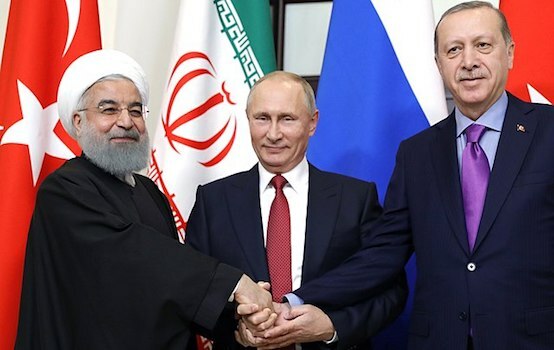 And it’s safe to say that Washington has left a lot of evidence that may reveal its true goals in the region. For instance a draft of the Foreign Operations, and Related Programs Appropriations Act was submitted to the US Congress back in 2017. This bill stipulated the allocation of 2.5 billion dollars on the so-called “promotion of democracy across Central Asia”. In addition, annually the US State Department would allocate funds to a network of NGOs operating across the region, those very NGOs that are, like in any part of the world, engaged in spreading disinformation and the promotion of political decisions advantageous for Washington. Among the sponsors of Central Asian “democratic values” one can find the Soros Foundation, the International Republican Institute, the National Democratic Institute, the Eurasia Foundation, and others. It shouldn’t be disregarded that the International Foundation Vozrozhdenie, which is financed by George Soros, played a pivotal role in the armed coup d’etat in Ukraine back in 2014. In late January, an Uzbekistan-based publication known as Caravanserai made a number of revelations about Washington’s strategy aimed at drawing Central Asia away from Russia, revealing a plan on the transition to the Latin alphabet. In American designs, the Latin alphabet serves, above all, as an instrument driving a cultural wedge between Russia and the republics of Central Asia. It seems that the United Central Command of the US Armed Forces that is funding the said publication the transition to the Latin writing must continue the policy of ousting the Russian language from areas of its historical distribution across Eurasia, thus compressing the Russian-speaking cultural and information space. The introduction of Latin is a symbolic act, which in the eyes of the sponsors of “Caravanserai” marks the mental and psychological turn of the countries of the region away from Russia. By choosing religion as an active tool for promoting anti-Russian views not only in Ukraine, but also in other countries of the former USSR, the US State Department has recently sent its ambassador-at-large for international religious freedom (sic) Sam Brownback to Uzbekistan. As for Uzbekistan itself, it has been trying to obtain maximum benefits from the current situation. Of course, there is nothing reprehensible in this strategy, since Tashkent is guided by its national interests that dictate playing one player against another to get a better deal. Yet, Uzbekistan has no intention of abandoning its traditional strategic military and economic ties with Russia, especially in a situation where it makes steps to deepen them. However, that was exactly was Ukraine tried to do before it was taken down by a pro-Western Nazi coup orchestrated by Washington. And the state the Ukrainian economy has been in ever since this coup is of no secret to anybody. Essentially, Kiev’s attempt to get a better deal from both parties resulted in instability, a shrinking population, and a bloody civil war with no visible end to it in sight. One shouldn’t forget that one may find himself paying an impossible price for attempts to flirt with Washington, as a color revolution may be just around the corner when the US doesn’t get what it wants one day.